90 points Wine Spectator: "Lovely powdered ginger and cardamom notes lead the way, followed by salted butter, blanched almond and nectarine flavors. The long, stylish finish has nice latent minerality. Very fine. Drink now through 2011. 200 cases imported." (09/10) 90 points Robert Parker's Wine Advocate: "Grown largely on distinctively pink and quartzite-laced schist, Michin's Chenin-based 2009 Fiefs Vendeens Les Clous incorporates 15% Chardonnay and 5% of the rare, indigenous Grollot (also spelled 'Groslot' or more commonly 'Grolleau') Gris. Apricot, quince, and diverse fruit blossoms hauntingly scent the nose and waft across a delicate, polished, subtly saline palate. Shrimp shell and lobster reduction lend saliva-inducing savor to the long finish of a striking wine for which you will find many uses at table. I have no experience with the maturation of this outstanding value, but given its quality and raw materials I suspect one need have no worry about following it for at least 4-5 years - though whether some of its charm will diminish (or perhaps be enhanced) I can't say." 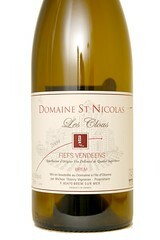 (08/10) This scrumptious white is a bland of 90% Chenin and 10% Grolleau average age 15 to 25 years. As with all this domaine's wines, this one is 100% bio-dynamic.